Bloomberg report that the structure of Guangzhou Opera House remains intact after a fire on May 9, according to Zaha Hadid Architects. The opening later in 2009 will be delayed. 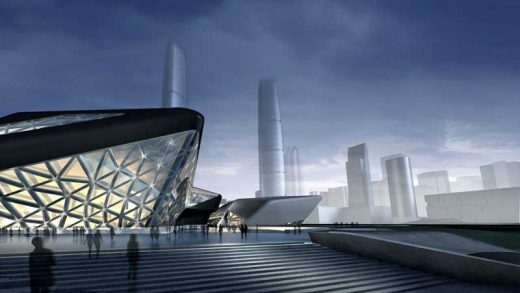 The structure rises and falls at the foot of Zhujiang Boulevard, bringing together the two adjacent sites for the proposed Museum and Metropolitan Activities. As an adjunct to the Haixinsha Tourist Park Island, the Opera House presents a contoured profile to provide a large riverside focus to visitors. When viewed from the park at the centre of the Zhujiang Boulevard, the Opera House creates a visual prelude to the Tourist Park Island beyond. 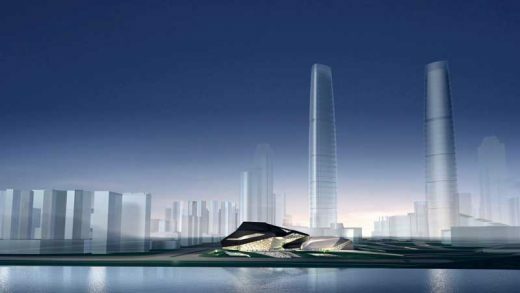 When viewed from the river, the towers of Zhujiang New Town provide a dramatic back-drop to the Opera House and give a unified vision of civic and cultural buildings on a riverside setting. leading to the Opera House. Cafe, bar, restaurant and retail facilities which are embedded shell-like into these landforms are located to one side of the approach promenade. Visitors arriving by car or bus are deposited at a “drop-off” on the north side of the site on Huajiu Road. Service vehicles access the Opera House and Theatre Buildings at either end of the Huajiu Road. VIP access to the Opera House is from the western boundary facing Huaxia Road. Project management: Guangzhou Municipal Construction Group Co. Ltd.
February 4, 2010 in Guangzhou.